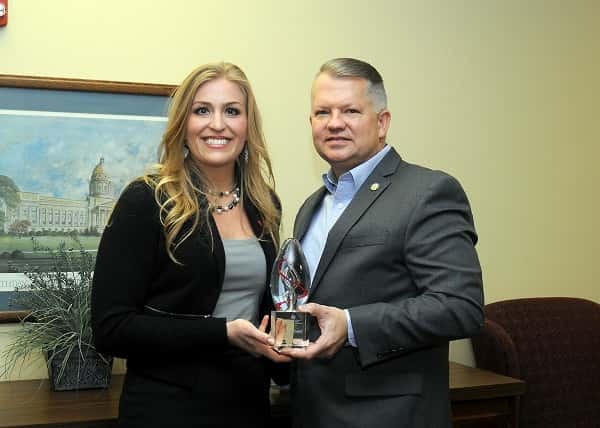 FRANKFORT, Ky. – Last month, Senator Danny Carroll (R-Paducah) was presented with the American Heart Association’s 2018 You’re the Cure Heart Hero Award for his efforts in passing Senate Bill 142 during the 2018 General Assembly. On Thursday, December 16, representatives from the American Heart Association presented Senator Danny Carroll of Paducah with the American Heart Association’s 2018 You’re the Cure Heart Hero Award. The award was given to Senator Carroll for championing Senate Bill 142, the telephone CPR bill. to provide detailed instructions over the phone to someone assisting a victim during out-of-hospital cardiac arrest. Association to get SB 142 signed into law. Their commitment to the heart health and safety of our citizens is unwavering and I believe this legislation will lead to lives saved in our great Commonwealth,” said Senator Carroll. Cardiac arrest is a leading cause of death in the U.S., and nearly 336,000 people experience cardiac arrest outside of a hospital each year. Unfortunately, nearly 90% of cardiac arrest victims do not survive mostly because they don’t receive timely CPR. When properly performed, CPR can double or triple a person’s chance of survival. For more information, visit yourethecure.org.